Come join us for the best of the best on the sand in Mission Beach. 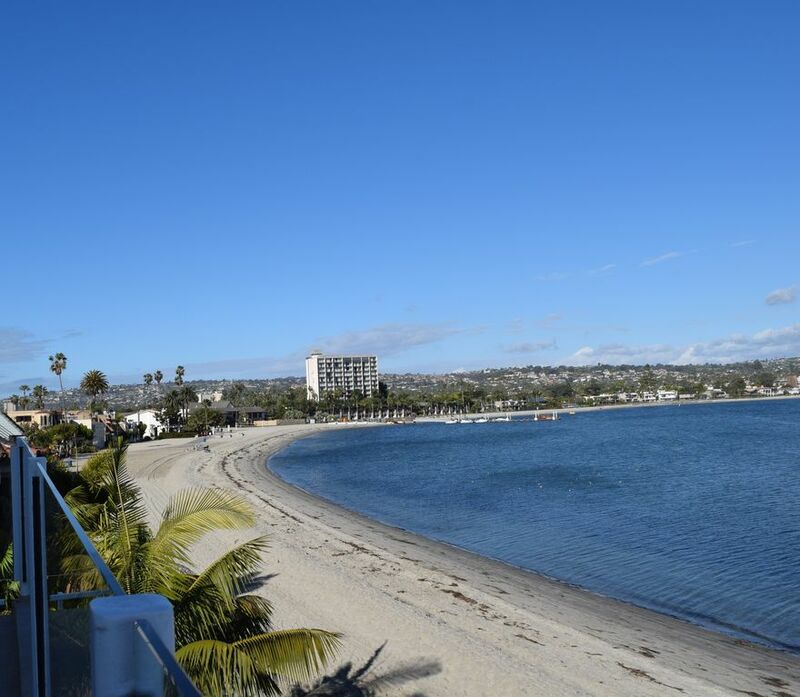 Our beach house has unobstructed views of Mission Bay and you can enjoy the nightly summmer fireworks show from the large private deck. The master bedroom (aka Captain's Quarters) has a comfy California king bed and a bathroom with a shower, jacuzzi tub, bidet and walk in closet. There are two more bedrooms down the hall, the Crew's Quarters with a comfy queen bed and the Mermaid room with a comfy queen bed. Off the hall are both a guest bathroom and a full bathroom. The kitchen is a cooks dream with a panoramic view of the water and all the amenities you will need, including built in appliances. We are located just down the sidewalk from the Catamaran Resort where the Bahia Belle and William D Evans (both sternwheelers) dock nightly. This property is right on Sail Bay across from The Aquatic Center! There is a private elevator that services this property. We also provide a laundy room with a washer and dryer. We welcome you to come experience it for yourself! THIS IS THE BEST OF THE BEST IN MISSION BEACH ON THE SAND! We are excited to offer it to you as your home away from home! Please come enjoy! Beach towels are not provided and we ask that you please not use our bath towels as beach towels. We loved our stay on the bay! The condo was in great condition and had everything we needed. The owners were very helpful and accommodating. Loved the location. We could walk to the shops, restaurants, and ocean and then retreat back to bay. Just perfect. Everything. The view, the accommodations (a cook/s kitchen), the parking spot, the location, and the service was excellent! Excellent Mission Beach condo in the right location. Our family got together for Christmas and New Years and rented this condo for 10 days. Everything was as advertised. It is clean and well stocked for whatever you plan to do while in Mission Beach. We really like staying on the bayside of Mission Beach and this condo is in the perfect location. The bayside is quieter and more laid back. If you want more action the ocean side is only a 5 minute walk and the nightlife in Pacific Beach is only a quick 15-20 minute walk. Parking at the condo is a little tight, as it is in all of Mission Beach. We have a midsize SUV (Toyota Highlander) and we fit ok. A Tahoe or Suburban would be a little tough getting in and out. Tom was great and does a thorough walk through with you when you arrive. The condo has everything you need for cooking in the kitchen and a great gas BBQ on the deck. When we arrived, we were a couple of hours early. We figured we would need to kill time until checkin time, but Susie told us to just call when we got close and Tom would meet us at the condo to check us in. We got checked in and settled 3 or 4 hours early. That made life a lot easier. We would definitely stay here again when we come to San Diego. Thanks Tom and Susie! We had an amazing time at the beach house. It is exactly as advertised. The home is very comfortable; they provided everything we needed! We (4 adults and a toddler) enjoyed the beautiful sunrise and the calm bay waters. We were a block from some of the best restaurants and coffee houses and two blocks from the ocean. Loved the location. Enjoyed being in the heart of the action and it was a very relaxing and comfortable space to return to each day. Would definitely return again. Thank you Susie for taking such good care of us! We loved this house. I was here with my husband, daughter and parents who are in their mid-80s. The elevator made this house perfect for my parents. Susie was a great host--she met us at the apartment and showed us everything we needed to know. Everything was spotless and we had all we needed including a washer and drier. The kitchen was well equipped with a gorgeous view of the bay. We enjoyed sitting on the deck overlooking the water. There's a table and chairs out there to eat meals. The only downside is the noise from neighbors partying at night, but things eventually quiet down. My dad is asking whether we could come back next year.